These are important, biologically active substances well known for their anti-inflammatory benefits. . Culinary Argan Oil contains around 18% in Triterpenes. Linoleic acids in Culinary Argan Oil increase production of prostaglandins 1 which are of help in rheumatologic conditions. Antioxidants, flavonoids, sapponins like Arganine and tocopherols are also found in very high levels. These nutrient can promote good circulation and have natural anti-inflammatory effects which are reported to help alleviate Arthritic pain. 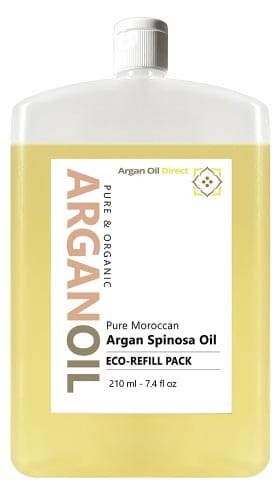 It is proposed that 15ml to 25ml ( about 1 to 2 tablespoons ) of culinary Argan Oil included in the diet could have a significant value as part of a natural Arthritis treatment plan. This is the typical amount given as a dietary supplement in studies. Most studies lasted around 6 weeks before the effects were recorded. Cosmetic Argan Oil is used as a carrier oil for making external pain-relieving massage oils. These blends are simple to make and effective when used on joints affected by Arthritis. Use a pure cosmetic Argan Oil for the oil base then add your chosen essential oils. Eucalyptus, Arnica, Mustard Seed and Ginger are popular choices for this. 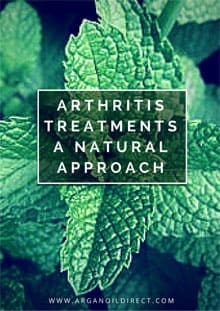 This 48 page eBook is about natural treatments and Arthritis, Rheumatoid Arthritis, Osteoarthritis and Psoriatic Arthritis. All information is provided with with links to references and scientific studies that tested the claims that are made. Sorry we had to make it a “Join to Download” but this was due to spam attacks from servers trying to download thousands of copies! SAMe, or s-adenosyl-methionine is a naturally occurring substance in the body. Numerous clinical studies have shown that SAMe can reduce pain, stiffness, and inflammation associated with degenerative joint problems. When compared to the common anti-inflammatory medications, Naproxen and Ibuprofen, SAMe did an equally effective job in reducing pain and inflammation over a three month period, and without the gastrointestinal damage caused by these drugs. Clinical studies show SAMe works well in countering the fatigue, inflammation and pain associated with fibromyalgia, a puzzling and hard to treat condition. Safety: In general, the longer SAMe is used, the more beneficial the results. There are no reported negative interactions with other medications or nutritional supplements. Spices have always been used as medicines. In one recent medical study, published in The Journal of Alternative and Complementary Medicine, Tumeric/ Curcumin was found to be more effective than ibuprofen for the treatment of knee osteoarthritis when taking 1,500 mg extract per day for 4 weeks. Curcumin was found to be better than other conventional medications at relieving the pain associated with rheumatoid arthritis . Curcumin is derived from the spice turmeric which is a member of the ginger family. Medical research with Curcumin or its parent, Turmeric, is increasing. Studies currently under-way indicate that Curcumin and turmeric may have benefits in cancers, skin conditions like psoriasis, Alzheimer’s disease, irritable bowel disease, autoimmune diseases and chronic pain. An autoimmune disease is a medical condition in which the body attacks itself. One autoimmune disease is rheumatoid arthritis with Asthma and Eczema like skin conditions being others. The standard anti-inflammatory medications used to help with the pain can damage the kidneys and increase the risk of stomach ulcers and bleeding. So an alternative safer pain-relieving product is needed for long-term use. Curcumin may be an option. In the medical journal Phytotherapy Research, two researchers showed that Curcumin is more effective than diclofenac for the pain associated with mild rheumatoid arthritis. In the study patients taking Curcumin for 8 weeks experienced a 44 percent reduction in pain. Those taking diclofenac had a 42 percent reduction. The Curcumin group also had a greater reduction in overall inflammation with no adverse side effects. Researchers cultured synovial fibroblasts from patients and exposed the cells to epigallocatechin-3-gallate (EGCG), a compound occurring in green tea. EGCG blocked two of the molecules that cause bone breakdown in rheumatoid arthritis-affected joints as well as production prostaglandin E2, which causes joint inflammation. Lead researcher, Dr Salah-uddin Ahmed, Ph.D., advised drinking three or four 8-ounce cups of green tea continuously throughout the day. Suggested Dose is up to 400 mg taken three times per day. The active ingredient is Boswellia and should be in a 60% concentration. Capsaicin is an active ingredient in cayenne which has potent pain-relief effects. It can be combined in creams and ointments which, when massaged in externally can help reduce pain. Researchers from Khon Kaen University in Thailand found that 0.0125 percent capsaicin gel was effective for treating mild-to-moderate knee osteoarthritis pains. Angelica has 12 anti-inflammatory compounds, 10 anti-spasmodic compounds and 5 pain-relieving compounds. Organo oil is rich in carvacrol which activates HSP ( heat shock proteins1 (HSP)) to stop experimentally induced autoimmune arthritis. Researchers described oregano oil as having an unprecedented capacity to activate HSP. Earlier animal studies also showed that the carvacrol oil was a potent pain killer. Oregano oil also has a powerful anti-bacterial, anti-fungal, and anti-parasitic effect. A standardised extract of celery seed which contained 85 percent 3nB was trialed for the treatment of rheumatism. A 12-week study had 15 subjects that suffered from either osteoarthritis, osteoporosis or gout. Participants were given 34 mg of celery seed extract two times a day. After three weeks there was an average reduction in pain levels of 68 percent. Some subjects had 100 percent relief from pain. The maximum benefits were felt after six weeks. A number of studies have confirmed that topically applied oils can decrease the severity of arthritis. “Essential oils and their components are rapidly absorbed through the skin and are detectable in plasma after topical application (Jaeger, 1992). The list about contains some of the essential oils thought to be most promising for natural Arthritis treatments. In conclusion, organic culinary Argan Oil, for eating could prove to be an effective alternative to common Arthritis anti-inflammatory drugs. This with foods that have high levels of plant derived linoleic acid can be a useful dietary supplement. Cosmetic Argan Oil can also be used combined with other natural oils, such as eucalyptus, as an external massage treatment. You can buy Culinary Argan Oil on this page or click below to visit our online shop. All prices include Fast and Free Delivery Worldwide. All our products are supported by a money back guarantee. Brien S, Lewith G, Walker A (2004). “Bromelain as a Treatment for Osteoarthritis: a Review of Clinical Studies”. Evidence-based complementary and alternative medicine: eCAM. 1 (3): 251–257. doi:10.1093/ecam/neh035. PMC 538506. PMID 15841258. That’s a great idea to collect such useful information! just wanted to take the moment and thank you for yr ebook and a free download. You can learn more about this at and do a search on these research papers.